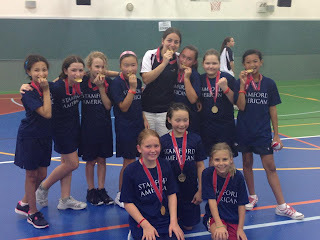 Each week I receive several emails asking for an update on my original blog post on Stamford American International School. So on the eve of orientation for the new school year, I figure it's about time to write about how last year turned out. I am thrilled with the education my children received last year. I credit most of that to the two teachers my children were lucky enough to get. Cooper had Mrs. Piroshka (PJ) Roth for 2nd grade and Sophia had Mr. Lachlan Wood for 4th grade. When you bring so many children together from so many backgrounds, it is difficult to create a work environment that challenges and supports everyone, and both teachers did an amazing job. When I had concerns (rare) they were addressed immediately and I feel my children were challenged and kept interested. I was also impressed with the amount of writing done in both grades, and was especially impressed with the public speaking exposure in Sophia's class. At one point, the kids were required to give a speech running for Class President, Vice President, Secretary or Treasurer, and the speeches were broadcast over the internet for the families to watch. The teacher even gave estimated times for parents so they could plan their day accordingly. We are rapidly coming to the end of our time here, and while we were at home in the US last month, both kids had to be tested for entrance to a school upon our return. They had to take part of the Stanford Achievement Test (not to be confused with Stamford :-) and I can tell you that they were *well* prepared for it. The test administrator was extremely impressed, and I attribute much of that to the curriculum at Stamford. I already praised their homeroom teachers, but I have to also give credit to all the other teachers I have met. I've gotten to know several of them pretty well, and I am confident that my kids are in great hands whether they are in math enrichment, PE, art class etc. They won the 10U Championship! 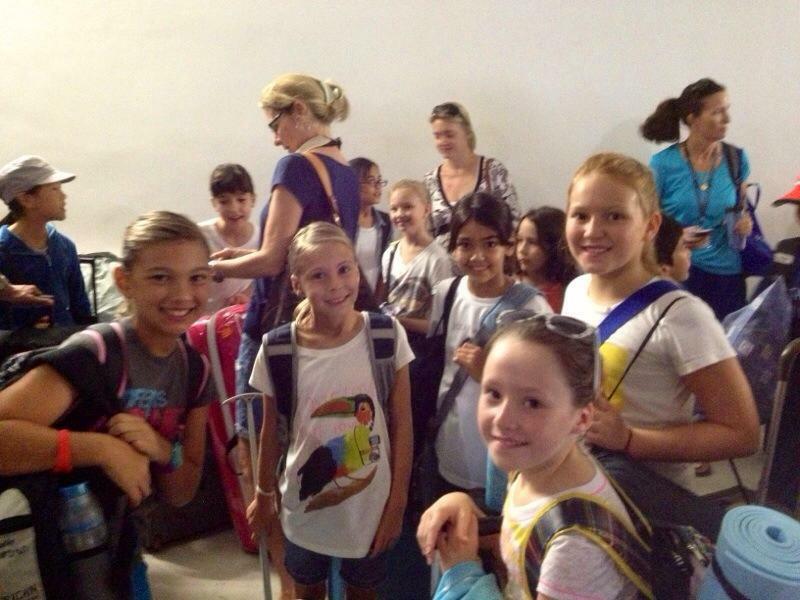 As far as the after-school activities, they are trying hard and have done a decent job ironing out some glitches. It's not perfect yet, but they've improved the sign-up process each time and they have a good variety of activity choices. If you have a high school-aged child who is a sports star, I am not sure this is the school for you (yet). I implore the school (because I know they will read this) to spend more money and effort on improving the athletics...it really is the key to winning over a huge demographic of parents out there. The kids need better uniforms, access to outside coaching and more diversity of sports. Note: There are many wonderful first-class coaches at SAIS, and we are lucky to have them. This is meant to suggest that not all coaches should be drawn from the pool of SAIS teachers. If parents have experience coaching, or it is smart to bring in outside coaches to make the teams competitive, then it should be done. Coming to Stamford, I was admittedly nervous of the whole "expat mom" culture. I don't get dressed up to go to school (okay, maybe I'll try to look decent at orientation tomorrow, but you will frequently see me in my exercise clothes!) and I am not one of those "ladies who lunch". After meeting the other moms, I feel silly that I was ever worried. I have made some of the most wonderful friends in the last year, and look forward to visiting these friends all over the world for many years to come. The school holds some really great events during the year. One is the International Fiesta, and features a ceremony much like the opening ceremonies of the Olympics. 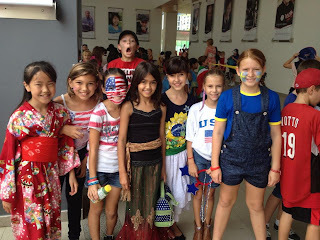 The children line up by country (and are encouraged to wear traditional dress of their homeland) and march around the gymnasium behind their respective flags. 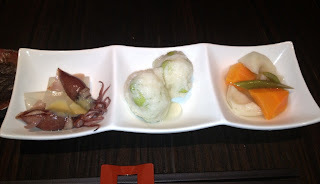 Many performances follow, and then country-specific food can be sampled. It was a really cool event, and I was fortunate that my in-laws just happened to be visiting at the time so they could witness it. Other major events include a huge, elaborate Halloween party, Christmas party with silent auction baskets provided by each class, and a fancy charity gala in the Spring. The PTA at Stamford certainly works hard! I'm sure I'm missing some things, but I hope this gives interested parties better insight into the school a year later. We have probably only five months left at Stamford and I'm truly devastated to leave. I thought we'd have at least another year, but that's not how it has worked out. Best of luck in your school decisions. There are many wonderful schools in Singapore, but for us, Stamford was hands down the right choice. As much I want to help, please do not send us questions on the school, as we have already repatriated to the US (March 2014). Best of luck! End of the silence from Singapore?? Perhaps I should have renamed this entire blog "Silent in Singapore" during the nearly three month hiatus since our last update. It was not intentional that Jennifer and I went so silent - far from it. If you haven't realized it yet, neither of us are short on words. Truth is, the last three months have been full of both new adventures as well as reunions with old friends and family. When I wrote my last post in May, we had just said farewell to my parents after their visit in Singapore and we were beginning to plan for our own "home leave" return to the US in late June. 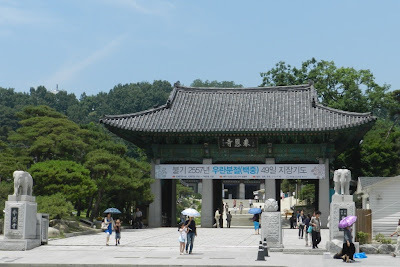 But before we packed the bags for our return to the States, we managed to squeeze in the end of Sophia and Cooper's school year, and a business trip to Japan and South Korea. 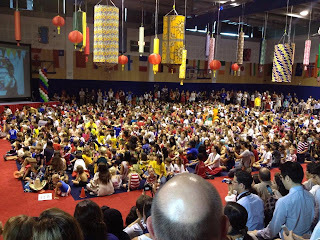 For the kids, the end of the year was both an exciting and sad experience. 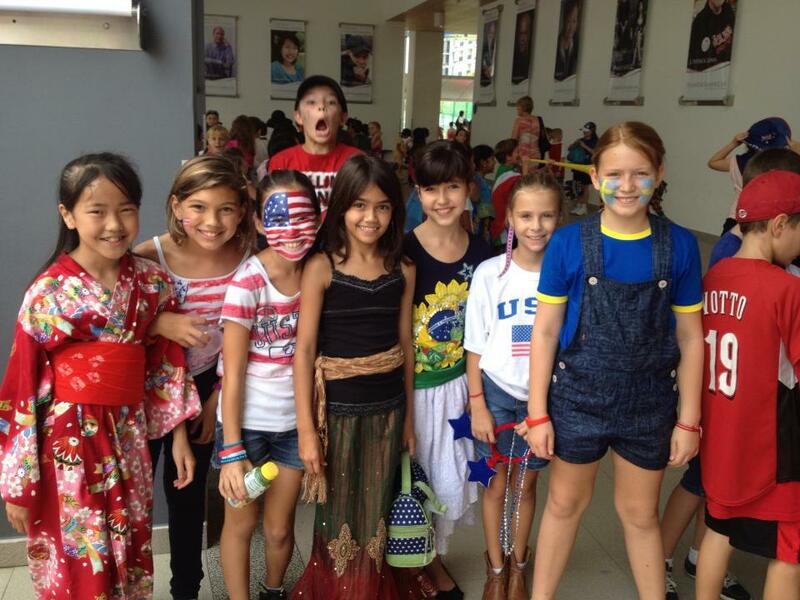 Both really enjoyed their teachers and had made great friends at SAIS, so they weren't really in a hurry for it to end. 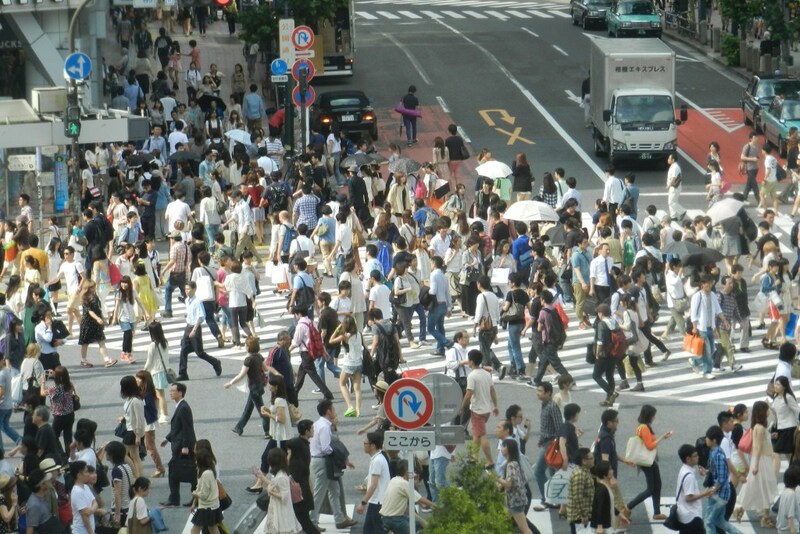 Some of their friends would return to their home countries for good at the end of the year, as their parents wrapped up their work assignments. Luckily for us, most friends were boarding planes for only short visits with family before returning to Singapore again for the 2013 / 2014 school year. On the final day of class, we all enjoyed a great afternoon with a few of these friends (the Foulds and Wihmans in particular) to wrap up the school year and began saying goodbyes before everyone set off on their summer vacations and home leave trips to the US, Europe, etc. The end of year party at the Belvedere pool gave way to my next adventure, and I headed directly to the airport for a week in Japan and South Korea. 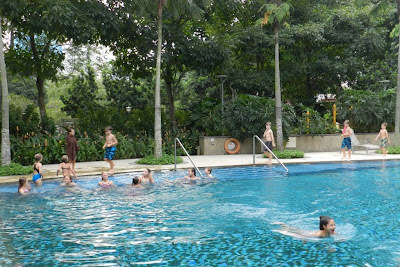 Since arriving in Singapore, both were high on my list of countries to visit and experience, and I was very excited about the opportunity to do so. First stop - Tokyo! After an overnight flight, I arrived at a rainy, chilly Narita airport. 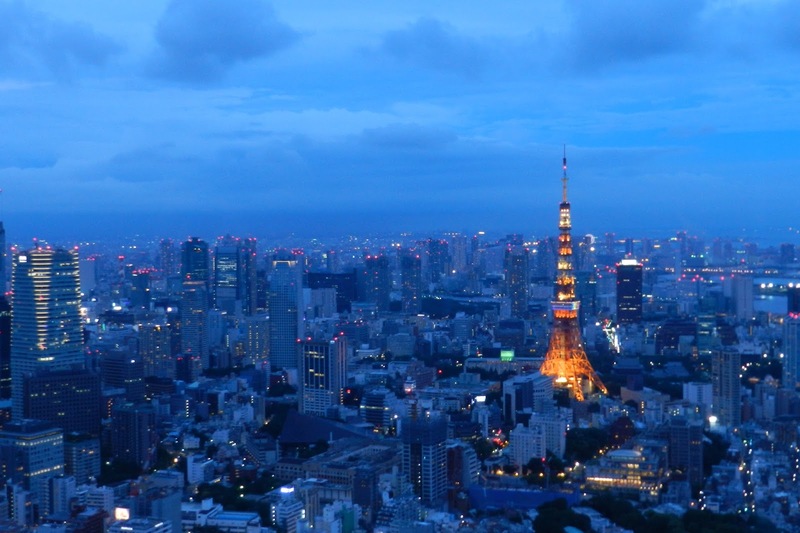 After nearly 18 months in Singapore, I didn't even consider taking a jacket with me to Tokyo in the summertime, but I sure could have used one on that dreary morning. Once again, I was impressed (perhaps a little disappointed) by the ease of immigration, speed through customs, and the giant, dummy proof signage directing me to the bus for my hotel. After check in and a quick shower at the Intercontinental ANA hotel, I was off to the SAP office with the help of the concierge, who wrote out the address in Japanese, and the white gloved taxi driver, who knew the way. 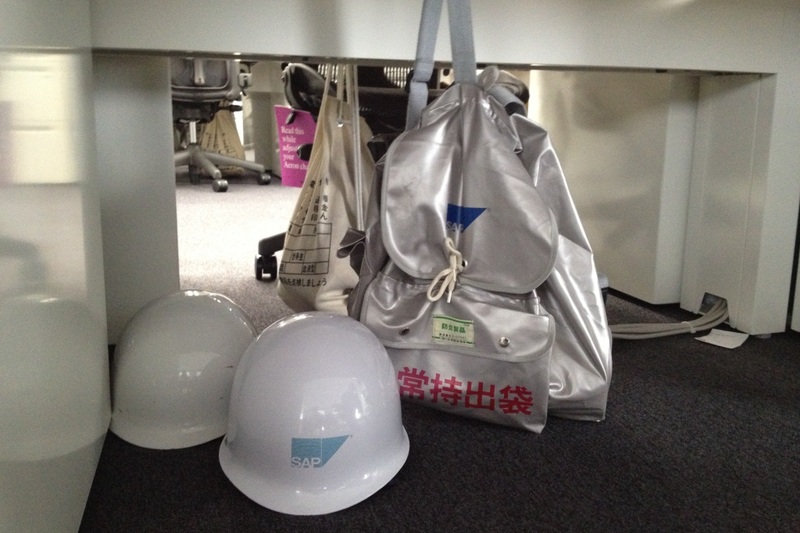 The Tokyo SAP office wasn't all that different from the office in Singapore or NSQ....except that I was one of only two white guys in the building... and the presence of earthquake emergency kits and hard hats at every desk! Luckily, these were not required during my visit. 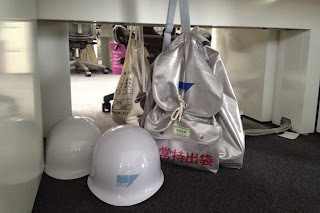 Though the office atmosphere was somewhat familiar, the unique challenges of communicating with and working with my Japanese colleagues were not. Dinner, likewise provided a great opportunity to experience Japan and Japanese culture! As expected, there was plenty of Sake, loads of sushi, several traditional Japanese favorites, and lots of laughs with the team. I also did my best to explore Tokyo outside the walls of SAP during my limited free time, and with the help and guidance of some co-workers, I was able to squeeze in a lot during my short stay. The highlights... a visit to the Shibuya train station and the Hachiko Dog statue (basis for the movie Hachi), the Shibuya "scatter" pedestrian crossing (apparently the busiest in the world), Yoyogi Park, the Meiji Shrine, and a walk down Takeshita Street. 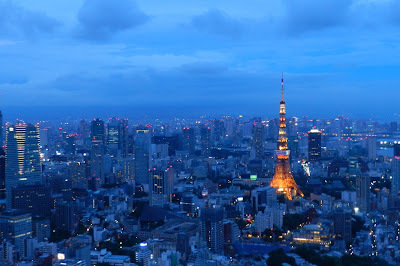 I also (briefly) checked out Roppongi Hill, but quickly made my way out of the tourist filled, red light district, and took in views of Tokyo Tower from the Mori Tower observation deck. I also got a "local" view of the Tokyo suburbs, albeit hosted by an American colleague, who took me for a Saturday morning jog along the Tama River. Although several nights of Sake consumption made the 10K jog more than I needed, I thoroughly enjoyed this unique perspective of "normal" life just outside the city - in particular, witnessing the intensity of Japanese little league baseball being played on fields along the river's edge. As my time wound down in Tokyo, I headed to the Haneda Airport for an EARLY morning flight to Seoul! Once again, my arrival, immigration, customs clearance, and finding transportation at Incheon airport were a breeze. 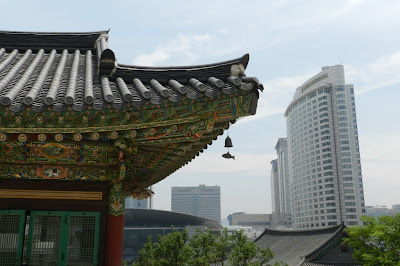 I arrived at the Intercontinental Parnas hotel in Gangnam-gu, Seoul, way too early to check in, so I decided to spend the time checking out the nearby Bongeunsa Buddhist Temple. 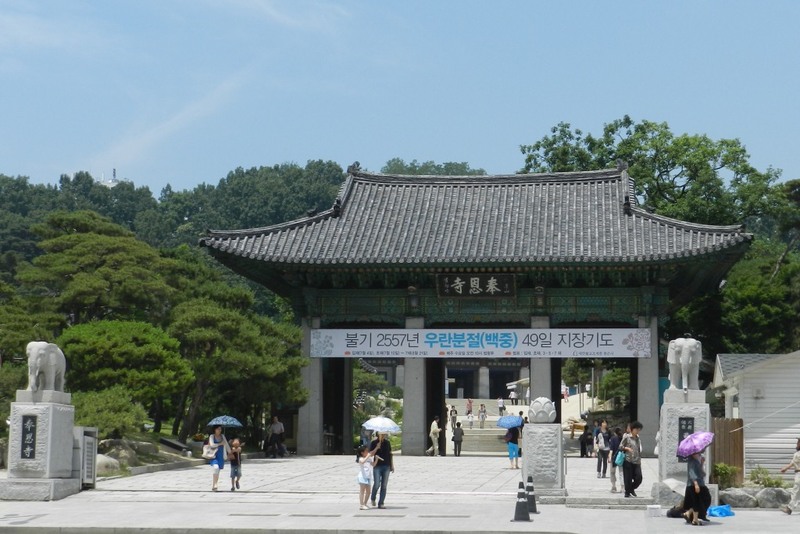 The temple, originally founded in 794, was severely damaged during the Joseon Dynasty between the late 1300s to 1800s - and furthermore during the Korean War. 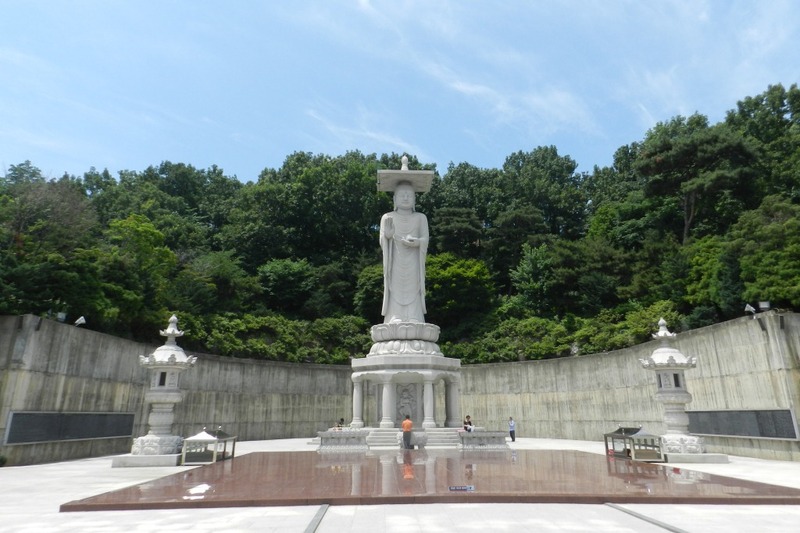 However, it has since been restored, and now provides a unique glimpse into the past among the modern shopping and condo complexes that make up most of Gangnam. Once again, I found my time in the SAP office to be a very rewarding professional experience, and my time at dinner (and the HOURS after dinner) to be very enlightening and entertaining. Let's just say my colleagues were tremendous hosts, who educated me on the wonders of late night drinks like Soju, Soju bombs, and Makgeolli, as well as a variety of traditional Korean foods... though I probably could have done without the fermented crab - and that last Soju bomb! 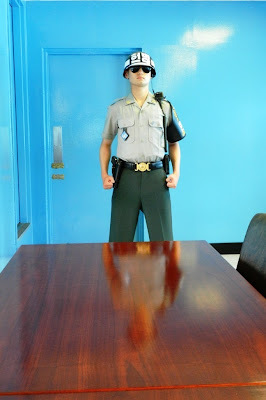 On my final day in Seoul, I had the opportunity to experience something unlike anything else I've done...a visit to the Demilitarized Zone and Joint Security Area (Panmunjom) between North and South Korea. It was an extremely educational and humbling experience and I would highly recommend it to anyone who visits Seoul. Make the time! My particular tour was through an organization called Korridor, with tours departing from the USO at Camp Kim. 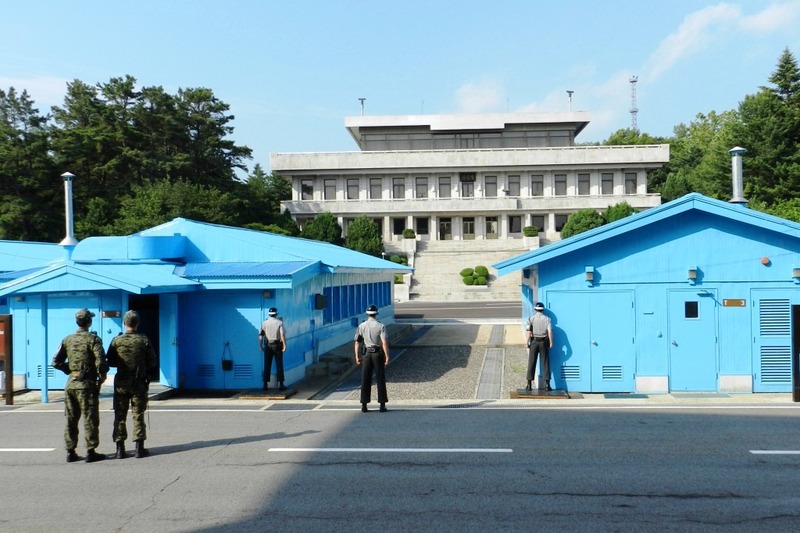 The tour included stops at Camp Bonifas, the 3rd Infiltration Tunnel, Dora Observatory, Dorasan Station, The Bridge of no Return, and the Joint Security Area. I'll be the first to admit, my knowledge of the Korean War was very limited before my visit, and I knew nothing about any of the places visited prior to the tour. I'm now so glad to have been educated, and will briefly describe the highlights. The first stop was the 3rd Infiltration Tunnel, a 1 mile long tunnel secretly dug by the North Koreans a few hundred feet beneath the DMZ. 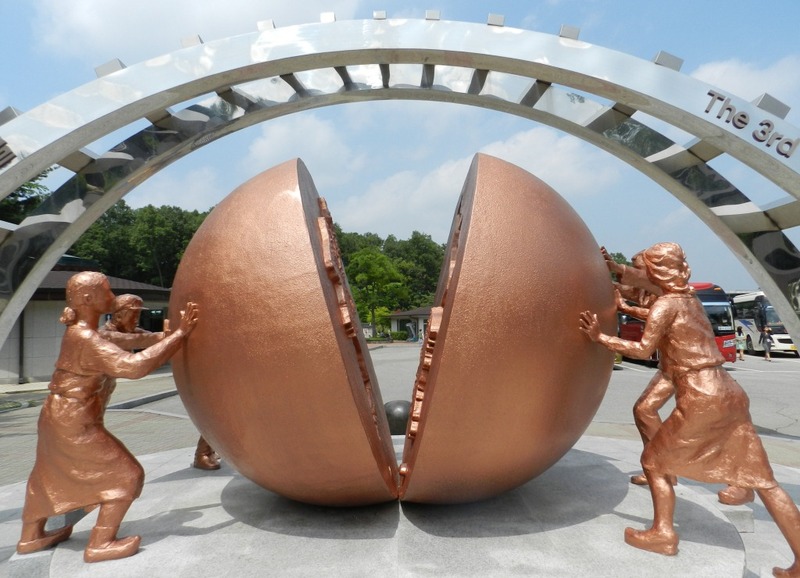 Intended to act as one of several tunnels to support a secret North Korean attack into South Korea, the tunnel was discovered after a North Korean defector informed the South in 1978. 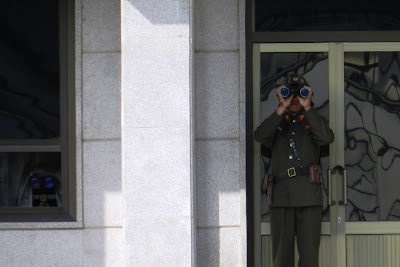 Nearby, we also visited the Dora Observatory, from which I got my first glimpse across the most heavily militarized border in the world, and into North Korea. 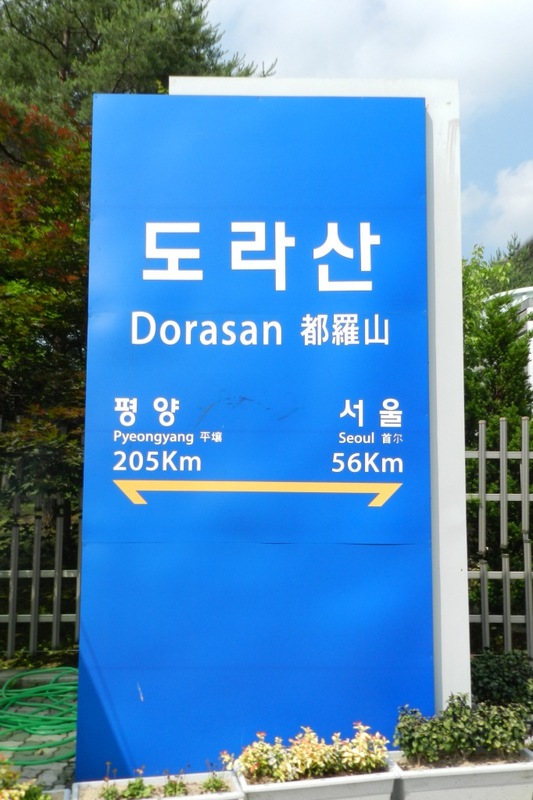 We also stopped at Dorasan Station, the final South Korean terminal on the railway connecting South Korea and North Korea. In order to visit the most amazing spot on the tour, the Joint Security Area situated directly on the border of North and South Korea, we first sat through a security briefing and transferred to a different bus at Camp Bonifas. Here, US and South Korean soldiers proudly declare they are "In Front of Them All", in reference to their forward-most position on the Korean peninsula. Following instructions to turn off all cameras, our bus entered the DMZ passing through a narrow stretch of road surrounded by explosive-lined barricades, mine fields, and high voltage fencing. If that weren't enough to internalize the nature of the conflict between the two countries, the armed military escorts on the bus and the armored lead vehicle ahead of the bus made it quite evident. Bill Clinton didn't call it the "scariest place on Earth" for nothing! North Korea is through that door! After a short drive, we reached the JSA, where we were just a few steps from the border, and eventually were able to set foot into North Korea, while inside one of the South Korean managed buildings that straddle the border between the two Koreas. Words and pictures really don't do it justice, and the experience remains one of the most unnerving, exhilarating, and yet humbling of my life. Just 72 hours after returning to Singapore from Seoul, I found myself back at the Changi airport, this time headed to the US for a few weeks with family and friends. 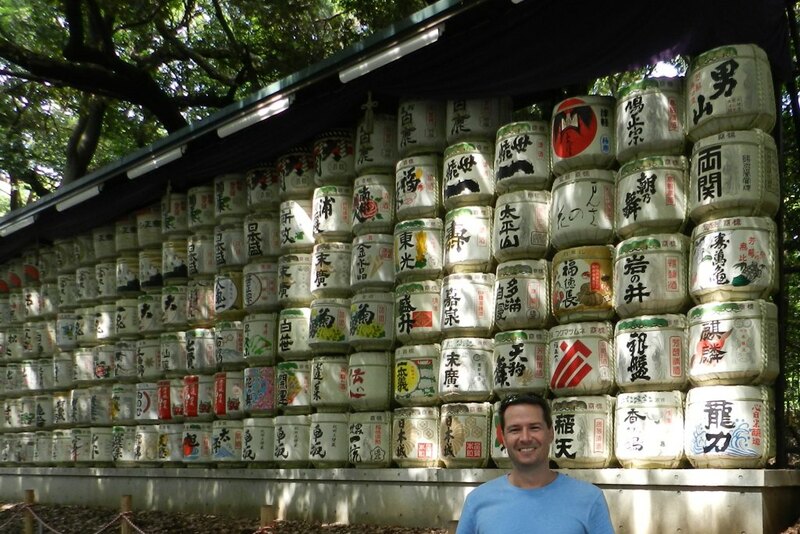 Looking back on the days before our trip "home" to the US, Japan and Korea both offered truly amazing and unique experiences. Once again, thanks to this blog, I'm forced to recount and document them... and that's a really good thing. Hopefully, this update will start the ball rolling again, and you can expect to see more from both Jennifer and I in the coming weeks on this page. After all, we've got plenty to say about our most recent visit with family and friends in Fenwick Island, DE, the corresponding visit from Scott and Kristen Lehman in Singapore... and the beginning of what could be our final 6 months on the "red dot". For now, I'm going to actually get some sleep in Singapore - and we'll do our best to avoid being "Silent in Singapore" ever again.